This Muslim man expresses his belief in equality for members of the LGBTQ community. Photo projects are a staple of the Internet as we know it today. From Humans of New York to Cake Wrecks to PostSecret, they’re a part of how art interacts with us every day. They create communities around themselves and reach out into every kind of social media. That’s the effect that Samra Habib, Toronto-based editor and photographer, has hoped to achieve. Her project, Just Me and Allah: A Queer Muslim Photo Project, debuted in 2014. She traveled her home city and cities all over the world, photographing and interviewing LGBTQ-identifying Muslims. She posted her work on Tumblr, which started a snowball effect of attention and community. When she began what she thought was going to be a small gallery show, three or four years ago, she was struggling with the feeling that the only attention given to Muslims, let alone queer Muslims, was attached to violence. But by moving her project online, she was able to create what she calls a digital neighborhood for them. Her photographed subjects are able and happy to find one another on Tumblr, the art-focused social platform, and she’s thrilled to learn when they befriend one another. 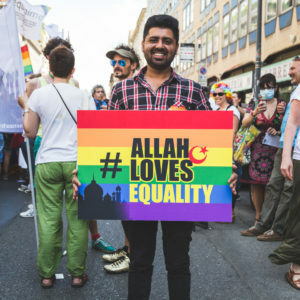 Via the Just me and Allah project, Habib has learned about more queer Muslim communities, like Unity Mosque and an annual American retreat for LGBT Muslims. She’s been able to introduce her communities to them, and has found new followers as well. The project is ongoing, and Habib has specific kinds of progress she wants to make. She’d like to be able to feature more older people—only one of her subjects so far has been over 40. Older folks have held back from her invitations. “I’ve learned this from my conversations with a lot of older folks: when they were in their 20s, for example, they made the decision that they’d either have to choose to be queer and super out, or be Muslim,” said Habib. And that is the entire point of her efforts—to show that one can be both, and still have community.